Some of the best parts of movies like Old School and Zombieland are their unexpected celebrity cameos. The same thing happens in comics, every once in a while. Here’s a look at another Celebrity Cameo! 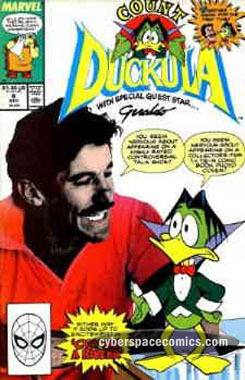 Geraldo Rivera can be seen prominently feature on the cover of Count Duckula #8 [August 1989]. Inside the book, they poke fun at his much-hyped The Mystery of Al Capone’s Vaults that fell far short of expectations.